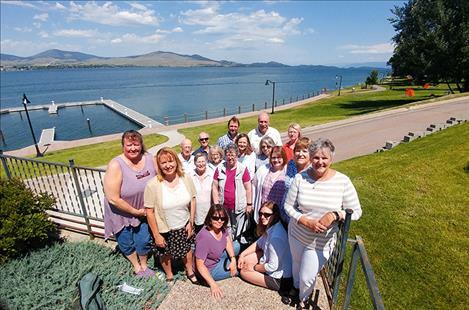 eater Polson Community Foundation board president Toni Young, right, stands with recipients of award grants at Sacajawea Park in Polson. On July 10, the Greater Polson Community Foundation awarded grant funds to 17 local non-profits as part of its 2018 grant cycle. Directors were on hand from CASA of Lake & Sanders Counties, Mission Valley Live, Polson Farm to School Program, Miracle of America Museum, International Choral Festival, Mission Valley Ice Arena, Flathead Lakers, Polson Loaves and Fish, Ninepipes Museum and North Lake County Public Library to share their grant projects and accept funds on behalf of the non–profits. “Being able to support our community non-profits and their projects is definitely a highlight of our year. We are able to do these grants because our donors truly love making a difference,” said GPCF Board President Toni Young. Gifts and donations make it possible to add significantly to the permanent endowment, which now totals over $650,000. Only the earnings can be used from this fund, and the GPCF board intends to continue adding to it. Grants are funded by earnings from the permanent endowment and are awarded annually. This year’s contributions will support youth and community-oriented projects including: youth swim lesson scholarships at MVA, Polson pickleball court enhancements, the Polson Loaves and Fish pantry backpack project, STEM program for the Boys and Girls Club of the Flathead Reservation, Flathead Lakers Citizen’s science program, Polson skatepark addition, resource guide for CASA advocates, educational outreach for Mission Valley Live performances, charging stations at the North Lake County Library, youth skating and hockey equipment for Mission Valley Ice Arena, the Farm to School Program for Polson School District No. 23, Polson concert by the International Choral Festival, upgrades for the Ninepipes Museum and the Miracle of America Museum. With these amazing 2018 grant projects off and running, the GPCF continues to put our words into action by inspiring philanthropy, community pride and improvement. If you would like to learn more about the Greater Polson Community Foundation you can contact us at 406-883-GPCF or visit our website at: www.greaterpolsoncommunityfoundation.org.